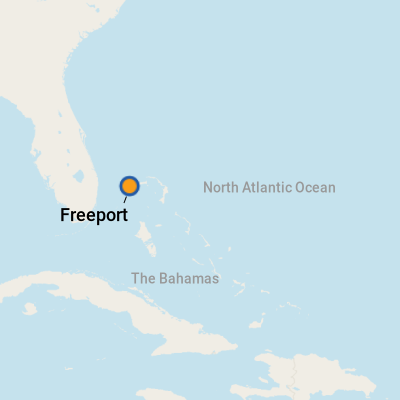 Freeport, an industrial center, is located on Grand Bahama Island, the archipelago's northernmost island. 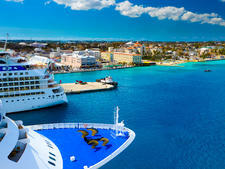 Grand Bahama, just 70 miles from Palm Beach, Florida, is a regular stop on the short-cruise circuit from South Florida. 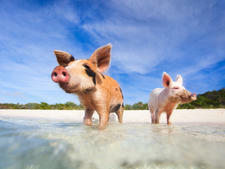 But the fourth-largest isle in the Bahamas' 700-strong chain, also owes its popularity to its smooth white-sand beaches and water sports, from snorkeling to deep sea fishing. 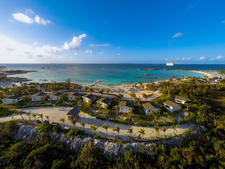 In the 1950s, the island realized its potential for tourism-related revenue when Wallace Groves, an American financier from Virginia, proposed building a town that both appealed to visitors and sufficiently supported industry. 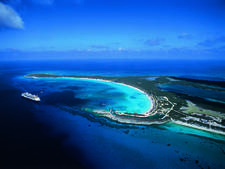 Since then, Freeport has boomed with hotels, restaurants, casinos and ecotourism attractions like Lucayan National Park. Its island atmosphere and miles of sunny beaches coupled with its close proximity to the United States makes Grand Bahama Island a top vacation spot for Americans. Port Lucaya and its marketplace have evolved into the tourist hub of the island, partly through design and partly because of hurricane damage to other parts of the area. Freeport's got everything from shops and beaches to restaurants and a casino -- not to mention a handful of major golf courses. Ships dock at Freeport Harbor, an isolated area that is a 10-minute drive from the city of Freeport and about a 25-minute ride from Port Lucaya. Taking an excursion or renting a car (or scooter) is an excellent option: The island is dotted with quiet beaches that are perfect for escaping the crowds. There's very little in Freeport Harbor. Sure, the port facilities look mighty pretty -- passengers arriving might spot pastel-colored bungalows selling souvenirs scattered about, plus a gazebo where a Bahamian band plays from time to time. But very few of the bungalows offer useful shops or services, with the exception of a snorkel and beach tour. Chain restaurants Fat Tuesdays and Senor Frogs and Pier One (a waterfront seafood restaurant) are located at the harbor, but that's about it. Industrial factories and refineries surround the port for miles before reaching anything of interest. Pickpockets and thieves target tourists, so keep your belongings protected. Also, while travel guides might still mention the International Bazaar (a once a robust collection of shops and restaurants), because of hurricanes, it's essentially a ghost town and not worth visiting the few remaining vendors. Taxis line up at the pier. If you are taking a taxi to a beach, arrange a time for your driver to pick you up to return. A taxi for two to Lucaya will cost about $25; if you ride in a collective van with other visitors, the fare would be about $5 per person each way. Otherwise, you can rent a car; Avis (800-331-1084) and Hertz-Red Kap Car Rental (242-352-9250) will send a courtesy van from the airport. Important note: Drive on the left! Motor scooters are also available for daily rentals from Island Jeep and Car Rental (Freeport Harbor; 242-351-7333) and cost around $65. When you exit the port, you can hop on a local bus as it turns around and heads back to Lucaya. However, there's no schedule posted; they simply run when they're full, so you might be waiting a while. This could be an option during the week for those on a tight budget, but they rarely run on weekends. 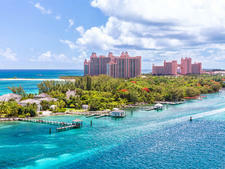 The currency is the Bahamian dollar, but U.S. dollars are accepted throughout the islands. ATMs are available at banks, but few provide U.S. dollars. For updated currency-conversion figures, visit www.oanda.com or www.xe.com. English is the official language -- British, not American -- but it might be laced with Bahamian dialect. Not surprisingly, seafood is a staple of residents, and the signature dish of the Bahamas is conch salad, chilled conch marinated in lime or orange juice and mixed with tomato, onion, celery, cucumber and green peppers. Many locals believe conch is an aphrodisiac, and the mollusk is also deep fried (cracked conch), mixed in stews or soups and served as a breaded appetizer (conch fritters). Other dishes include Bahamian "rock lobster," fresh grouper and bonefish accompanied by side dishes like peas and rice or johnnycake (simple bread). Wash it all down with the appropriately named, "Gully Wash," the Bahamian cocktail made with gin, coconut water and condensed milk. Port Lucaya Marketplace: Options abound, and two favorites are Cafe Breeze (242-373-2664; open daily from 9 a.m. to 10 p.m.) and Zorba's Greek restaurant (242-373-6137; open daily 7 a.m. to 10:45 p.m.). A straw basket purchased at the straw market and the square 15-cent Bahamian coin you receive as part of your change make nice mementos from your visit. Try a Goombay Smash at Sparky's, located in Port Lucaya Marketplace. The drink is a mix of spiced rum, coconut rum, apricot brandy, pineapple juice, orange juice and "secret ingredient."